There are three broad categories of forest definitions in use: administrative, land use, and land cover. Administrative definitions are based primarily upon the legal designations of land, and commonly bear little relationship to the vegetation growing on the land: land that is legally designated as a forest is defined as a forest even if no trees are growing on it. Land use definitions are based upon the primary purpose that the land serves. 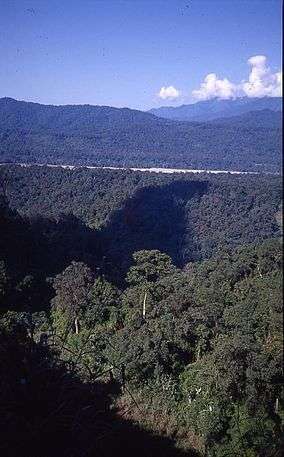 For example, a forest may defined as any land that is used primarily for production of timber. Under such a land use definition, cleared roads or infrastructure within an area used for forestry, or areas within the region that have been cleared by harvesting, disease or fire are still considered forests even if they contain no trees. Land cover definitions define forests based upon the type and density of vegetation growing on the land. 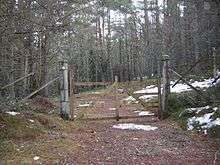 Such definitions typically define a forest as an area growing trees above some threshold. These thresholds are typically the number of trees per area (density), the area of ground under the tree canopy (canopy cover) or the section of land that is occupied by the cross-section of tree trunks (basal area). Under such land cover definitions, and area of land only be defined as forest if it is growing trees. Areas that fail to meet the land cover definition may be still included under while immature trees are establishing if they are expected to meet the definition at maturity. Conversely some areas covered in trees are legally defined as agricultural areas. 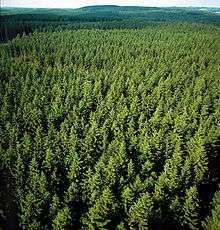 For example, Norway spruce plantations in Austrian forest law when the trees are being grown as Christmas trees and below a certain height. Forest floor contains decomposing leaves, animal droppings, and dead trees. All of decay on the forest floor and form the new soil and provides nutrients to the plants. The forest floor supports ferns, grasses, mushroom and trees seedlings. Forests provide a diversity of ecosystem services including converting carbon dioxide into oxygen and biomass, acting as a carbon sink, aiding in regulating climate, purifying water, mitigating natural hazards such as floods, and serving as a genetic reserve. 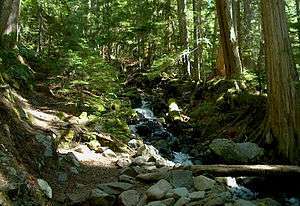 Forests also serve as a source of lumber and as recreational areas. In 2010, the Food and Agriculture Organization of the United Nations reported that world deforestation, mainly the conversion of tropical forests to agricultural land, had decreased over the past ten years but still continues at a high rate in many countries. Globally, around 13 million hectares of forests were converted to other uses or lost through natural causes each year between 2000 and 2010 as compared to around 16 million hectares per year during the 1990s. The study covered 233 countries and areas. Brazil and Indonesia, which had the highest loss of forests in the 1990s, have significantly reduced their deforestation rates. China instituted a ban on logging, beginning in 1998, due to the erosion and flooding that it caused. In addition, ambitious tree planting programmes in countries such as China, India, the United States and Vietnam - combined with natural expansion of forests in some regions - have added more than seven million hectares of new forests annually. As a result, the net loss of forest area was reduced to 5.2 million hectares per year between 2000 and 2010, down from 8.3 million hectares annually in the 1990s. In 2015, a study for Nature Climate Change showed that the trend has recently been reversed, leading to an "overall gain" in global biomass and forests. This gain is due especially to reforestation in China and Russia. However new forests are not completely equivalent to old growth forests in terms of species diversity, resilience and carbon capture. On September 7, 2015, the Food and Agriculture Organization of the United Nations released a new study stating that, over the last 25 years, the global deforestation rate has decreased by 50% due to improved management of forests and greater government protection. By December 2006, over 1,237,000 square kilometers of forest land in Canada (about half the global total) had been certified as being sustainably managed. Clearcutting, first used in the latter half of the 20th century, is less expensive, but devastating to the environment, and companies are required by law to ensure that harvested areas are adequately regenerated. Most Canadian provinces have regulations limiting the size of clearcuts, although some older clearcuts can range upwards of 110 square kilometres (27,000 acres) in size which were cut over several years. Trees on a mountain in northern Utah during early autumn. In the United States, most forests have historically been affected by humans to some degree, though in recent years improved forestry practices has helped regulate or moderate large scale or severe impacts. 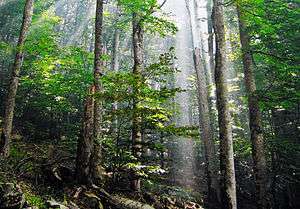 However, the United States Forest Service estimates a net loss of about 2 million hectares (4,942,000 acres) between 1997 and 2020; this estimate includes conversion of forest land to other uses, including urban and suburban development, as well as afforestation and natural reversion of abandoned crop and pasture land to forest. However, in many areas of the United States, the area of forest is stable or increasing, particularly in many northern states. The opposite problem from flooding has plagued national forests, with loggers complaining that a lack of thinning and proper forest management has resulted in large forest fires. ↑ "Forest". Dictionary.com. Retrieved 2014-11-16. ↑ Schuck, Andreas; Päivinen, Risto; Hytönend, Tuomo; Pajari, Brita (2002). "Compilation of Forestry Terms and Definitions" (PDF). Joensuu, Finland: European Forest Institute. Retrieved 2014-11-16. ↑ "Definitions: Indicative definitions taken from the Report of the ad hoc technical expert group on forest biological diversity". Convention on Biological Diversity. Retrieved 2014-11-16. 1 2 3 "Forest definition and extent" (PDF). United Nations Environment Programme. 2010-01-27. Retrieved 2014-11-16. ↑ "Comparative framework and Options for harmonization of definitions". Second Expert Meeting on Harmonizing Forest-Related Definitions. FAO. Retrieved 2014-11-26. ↑ Johnson, F.X. ; Pacini, H.; Smeets, E (2013). Transformations in EU biofuels markets under the Renewable Energy Directive and the implications for land use, trade and forests. CIFOR. p. 32. ISBN 9786028693813. 1 2 3 Pan, Yude; Birdsey, Richard A.; Phillips, Oliver L.; Jackson, Robert B. (2013). "The Structure, Distribution, and Biomass of the World's Forests" (PDF). Annu. Rev. Ecol. Evol. Syst. 44: 593–62. doi:10.1146/annurev-ecolsys-110512-135914. ↑ Vogt, Kristina A, ed. (2007). "Global Societies and Forest Legacies Creating Today's Forest Landscapes". Forests and Society: Sustainability and Life Cycles of Forests in Human Landscapes. CABI. pp. 30–59. ISBN 9781845930981. 1 2 MacDicken, Kenneth (2013-03-15). "Forest Resources Assessment Working Paper 180" (PDF). Rome: Food and Agriculture Organization of the United Nations Forestry Department. Retrieved 2014-11-16. 1 2 3 4 5 Watson, Robert T.; Verardo, David J.; Noble, Ian R.; Bolin, Bert; Ravindranath, N.H.; Dokken, David J., eds. (2000). "Land Use, Land-Use Change and Forestry". Intergovernmental Panel on Climate Change. Retrieved 2014-11-16. ↑ Menzies, Nicholas; Grinspoon, Elisabeth (2007-10-22). "Facts on Forests and Forestry". ForestFacts.org, a subsidiary of GreenFacts.org. Retrieved 2014-11-16. ↑ "Introduction: Definition of a Forest". MuseumLink Illinois. Retrieved 2014-11-16. ↑ "A Polish Royal Forest". NASA Earth Observatory. November 29, 2013. ↑ "Broadsheet: The News Letter for Broadland Tree Wardens" (PDF). April 2011. Retrieved 2014-11-16. ↑ Ritter, E (2011). Dauksta, D, ed. New Perspectives on People and Forests. World Forests. 9. Springer. ISBN 94-007-1149-2. 1 2 3 "forest, noun". Oxford English Dictionary online edition. Oxford University Press. Retrieved 22 May 2009. ↑ "forest, noun". The American Heritage Dictionary of the English Language (3 ed.). Boston: Houghton Mifflin Company. 1996. ISBN 0-395-44895-6. ↑ "What is a Forest?". Australian Government/Department of Agriculture, Fisheries, and Forestry/Rural Areas. 28 March 2007. Archived from the original on 9 October 2009. Retrieved 25 November 2010. 1 2 3 4 "The First Forests". Devonian Times. Retrieved 2016-05-28. ↑ The Living World. D.A.V. College Managing Committee. ↑ Amos, Jonathan (3 September 2015). 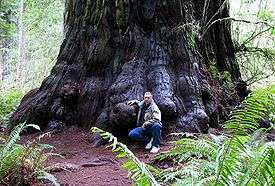 "Earth's trees number 'three trillion'". BBC. Retrieved 3 September 2015. 1 2 Chazdon, Robin L. (2008). "Beyond deforestation: restoring forests and ecosystem services on degraded lands" (PDF). Science. 320 (5882): 1458–1460. Bibcode:2008Sci...320.1458C. doi:10.1126/science.1155365. PMID 18556551. 1 2 3 4 5 6 7 Jenkins, Martin D.; Groombridge, Brian (2002). World Atlas of Biodiversity: Earth's Living Resources in the 21st Century. World Conservation Monitoring Centre, United Nations Environment Programme. ISBN 9780520236684. ↑ Chape, S; Spalding, M; Jenkins, M (2008). The world's protected areas: status, values and prospects in the 21st century. Univ de Castilla La Mancha. ISBN 0520246608. 1 2 Nasi, R; Wunder, S; Campos A, JJ (March 11, 2002). 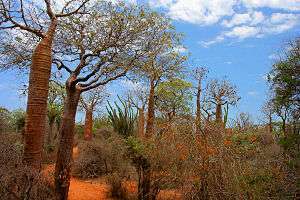 "Forest ecosystem services: can they pay our way out of deforestation?" (PDF). UNFF II. Costa Rica. ↑ Emerton, Lucy (1999). Mount Kenya: The Economics Of Community Conservation (PDF) (Community Conservation research Working Paper). Evaluating Eden Series. University of Manchester Institute of Development Policy and Management. ↑ Henneleen de Boo, Henk Lette (2002). "Economic Valuation of Forests and Nature A support tool for effective decision-making". Theme Studies Series 6 Forests. 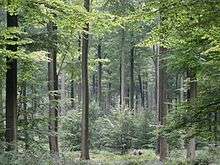 Ede, The Netherlands: Forestry and Biodiversity Support Group, International Agricultural Centre (IAC), Wageningen National Reference Centre for Agriculture, Nature Management and Fisheries (EC-LNV). ↑ Bishop, Joshua T., ed. (1999). Valuing Forests A Review of Methods and Applications in Developing Countries. London: Environmental Economics Programme, International Institute for Environment and Development (IIED). ↑ Gray, Emma F.; Bond, William J. (2013). "Will woody plant encroachment impact the visitor experience and economy of conservation areas?". Koedoe. 55 (1). ISSN 0075-6458. ↑ Scholes, R.J.; Archer, S.R. (1997). "Tree-Grass Interactions in Savannas" (PDF). Annual Review of Ecology and Systematics. 28: 517–544. doi:10.1146/annurev.ecolsys.28.1.517. ↑ Pimentel, David; Pimentel, Marcia H. (2007). Food, Energy, and Society. CRC Press. ↑ Ratajczak, Zakary; Nippert, Jesse B.; Collins, Scott L. (2012). "Woody encroachment decreases diversity across North American grasslands and savannas" (PDF). Ecology. 93 (4): 697–703. doi:10.1890/11-1199.1. PMID 22690619. ↑ Parr, Catherine L.; Gray, Emma F.; Bond, William J. (2012). "Cascading biodiversity and functional consequences of a global change–induced biome switch" (PDF). Diversity and Distributions. 18 (5): 493–503. doi:10.1111/j.1472-4642.2012.00882.x. ↑ Wilcox, B.P. ; Kreuter, U.P. (2003). Woody plant: streamflow interactions as a basis for land management decisions in drylands. Proceedings VIIth International Rangelands Congress. pp. 989–996. ↑ Scott, D.F. (1999). "Managing riparian vegetation to sustain streamflow: results of paired catchment experiments in South Africa" (PDF). Canadian Journal of Forest Research. 29 (7): 1149–115. doi:10.1139/x99-042. ↑ Davidson, A; Elliston, L; Kokic, P; Lawson, K (2005). "Native vegetation: cost of preservation in Australia" (PDF). Australian Commodities. 12 (3): 543–548. ↑ Wilcox, B.A. ; Ellis, B. "Forests and emerging infectious diseases of humans". Food and Agriculture Organization of the United Nations. Retrieved 2014-11-16. ↑ Margaletic, J (2003). "Small rodents in the forest ecosystem as infectious disease reservoirs". Acta Med Croatica (in Croatian). 57 (5): 421–6. PMID 15011471. ↑ "FAO. 2010. Global Forest Resources Assessment 2010. Main report. FAO Forestry Paper 163. Rome, Italy". Fao.org. Retrieved 3 July 2013. ↑ "Ban on Logging Saves Forests". 25 October 2001. ↑ Liu, Yi Y.; van Dijk, Albert I.J.M. ; de Jeu, Richard A.M.; Canadell, Josep G.; McCabe, Matthew F.; Evans, Jason P.; Wang, Guojie (30 March 2015). "Recent reversal in loss of global terrestrial biomass". 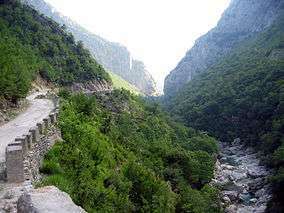 Nature Climate Change. 5 (5): 470. Bibcode:2015NatCC...5..470L. doi:10.1038/nclimate2581. ↑ "World deforestation slows down as more forests are better managed". fao.org. Food and Agriculture Organization of the United Nation. Retrieved 2 October 2015. ↑ MacDicken, K.; Jonsson, Ö.; Piña, L.; Maulo, S.; Adikari, Y.; Garzuglia, M.; Lindquist, E.; Reams, G.; D’Annunzio, R. "Global Forest Resources Assessment 2015" (PDF). fao.org. Food and Agriculture Organization of the United Nations. Retrieved 2 October 2015. ↑ "Canada". Global Forest Watch Canada. Retrieved 2014-11-28. 1 2 "Canada's Forests". Natural Resources Canada. 2014-10-14. Retrieved 2014-11-28. ↑ "Statistics". Certification status - Canada & the globe. Canadian Sustainable Forestry Certification Coalition. Retrieved 2014-11-28. ↑ "Wildfires Ignite Forest Management Debate". Wildrockiesalliance.org. Retrieved 3 July 2013. ↑ Brock, Emily K. (2015). Money Trees: The Douglas Fir and American Forestry, 1900-1944. Oregon State University Press. ↑ "Forest Land Area". FAOSTAT. World Bank. 12 February 2014. Wilhelm Schlich and Gifford Pinchot (1911). "Forests and Forestry". Encyclopædia Britannica (11th ed. ).